Angama Mara, the latest addition to the Mara family. A US travel magazine has named Kenya's Angama Mara, as the world's best safari lodge for 2017. 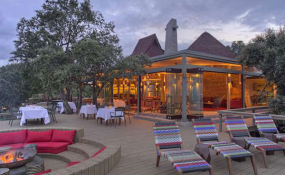 The luxury lodge located on the western edge of the Maasai Mara Game Reserve was the only Kenyan facility to make it into Jetsetter's annual listing. Its location near the crossing points for wildlife during the annual wildebeest migration between Kenya and Tanzania, on the edge of an escarpment overlooking the Mara Triangle, gives visitors an exceptional view of the Maasai Mara. Angama beat 10 other world-renowned safari lodges including Namibia's Wilderness Safaris Hoanib Skeleton Coast Camp and India's Jawai Leopard camp, which came second and third respectively. Rwanda's Virunga lodge, with its famous sanctuary for the critically endangered mountain gorilla was fourth while Australia's Arkaba's homestead and Zambia's Chinzobo camp secured the fifth and sixth positions respectively. Despite the devastating earthquakes that have rocked Nepal in recent years, putting a dent on the mountainous country's tourism industry, the country's Meghauli Serai lodge came in seventh on the list. Serai is located inside Chitwan National Park and is a wildlife sanctuary for rare and exotic species including one-horned rhinos, sloth bears and royal Bengal tigers. Andbeyond Sandibe Okavango Lodge in Botswana, Singita Gurumeti Serengeti House in Tanzania, Thailand's Anantara Resort Golden Triangle and South Africa's Nelson Mandela Centre for Reconciliation Villa took the last four positions in the ranking respectively.